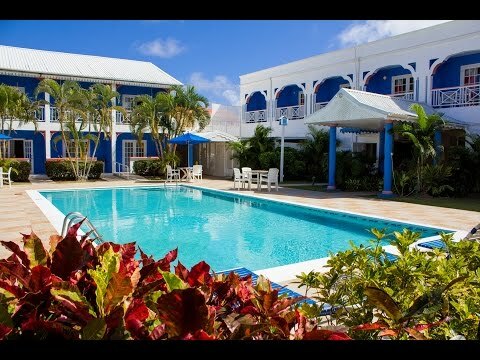 Slipping into island life’s never been so easy — Bay Gardens Inn delivers the authentic St Lucia experience you can only find at a small inn, but all the fun and features of a big resort hotel. That’s because it’s three hotels in one. You’ll stay at the intimate 33 room inn in Rodney Bay Village, but get complimentary travel to its two ‘big sister’ hotels, including one on Reduit Beach. So you can spend days enjoying free water sports, sunbathing, and taking on the challenge of Splash Island Water Park — an open water adventure course just off shore. You can also use their other facilities, from the kids’ club to the spa. The inn’s got surprises up its own short summer sleeves too, including a sun-trap of a pool, complimentary WiFi, and the tavern treats of its Ti Ponche Bar. Perfectly located on the North of the island. Transfer time from airport: 1 hour 30 minutes. 33 rooms. All with individual climate control, ceiling fan, cable TV, telephone, complimentary WiFi, clock radio/alarm, mini-fridge, kettle and coffee maker, safe, iron and board, shower or bathtub and hairdryer. Standard Rooms feature authentic wicker and wooden furnishings along with a private balcony or terrace, with 1 king-size bed, sleeping maximum 2 adults. Please note: supplements will apply to select food items at the Bay Gardens Hotel or Inn; house brand beverages only are covered under this plan at the Bay Gardens Hotel or Inn. Added privileges are subject to change. Breakfast option:includes breakfast daily. Unlimited complimentary passes to Splash Island Water Park. Superior Rooms benefit from lovely views across the lush tropical gardens or pool from the private balcony or terrace, with 1 king-size bed or 2 double beds, sleeping maximum 4 adults or 2 adults and 2 children. Deluxe Rooms feature French doors leading to a private furnished balcony or terrace, overlooking the pool. With 1 king-size bed or 2 double beds, sleeping maximum 4 adults or 2 adults and 2 children. Free Nights: Stay for 7 nights, pay for 6 (stay for 14, pay for 12) for stays completed between 20 Dec &apos;18–31 Oct &apos;19. Creole Pot Restaurant serving Caribbean cuisine (open daily 7:00am-11:00am). Ti Poche Bar serving classic cocktails, wine and local brews as well as soft drinks (open daily 10:00am-10:30pm). Guests can head next door or hop on the complimentary shuttle to sample the cuisine and cocktails of the sister resorts, Bay Gardens Hotel and Bay Gardens Beach Resort & Spa. Room service*. Thursday Night Manager&apos;s Cocktail party with complimentary rum punch. The hotel also has regular barbecues and weekly live entertainment. Freshwater swimming pool with terrace and loungers. La Mer Spa* located at Bay Gardens Beach Resort & Spa. Complimentary access to a range of fun fitness and wellness activities offers at the flagship Bay Gardens Beach Resort & Spa, including pilates, yoga, beach volleyball and aqua aerobics. Motorised* and non-motorised water sports on Reduit Beach with the Saluna Water Sports team include, Hobie Cat sailing, kayaking, stand-up paddle boarding, paddle boats, wake-boarding and water-skiing. They can also arrange water taxi trips to Pigeon Island* or snorkelling trips*. Scuba diving* is available with Dive Saint Lucia, the island’s premier scuba diving centre. Splash Island Water Park*. Coral Kidz Club featuring fun, supervised activities for children aged 4-12 years (Tue-Sun, 10:00am-4:00pm). Based at Bay Gardens Beach Resort & Spa, the club welcomes guests of all three hotels for a wide variety of activities, including crab hunts, arts and crafts, nature walks, table tennis and beach games. Nearby golf course*. Please note: the pool at Bay Gardens Beach Resort & Spa is not accessible to Bay Gardens Inn guests. The hotel offers a free shuttle service to sister hotel, Bay Gardens Beach Resort & Spa, situated on Reduit Beach. Complimentary WiFi in rooms and public areas. Babysitting services*. Tour desk* located at Bay Gardens Beach Resort & Spa. Concierge service. Laundry services*. **Reduit Beach is a 15-minute walk away or take advantage of the hotel&apos;s complimentary shuttle service which drops you to the sister property so you can use the Beach and other facilities (except the pool) and charge anything you eat or drink back to your room at the Bay Gardens Inn, so there is no need to take any money with you (once you leave an impression of your credit card at Bay Gardens Inn). Please note: in order to sign any food and beverage items, spa treatments or additional tickets for Splash Island Water Park back to your room, you are required to leave a copy of your credit card on file at reception. For clients staying on AI at the Bay Gardens Hotel or Bay Gardens Inn there maybe supplements on menu items at the Bay Gardens Beach Resort restaurants. Charges apply to motorised water-sports. Please note: the swimming pool at Bay Gardens Beach Resort & Spa is strictly for use by guests of the resort only. Stayed here in March with my partner. Lovely place, quiet and relaxing. Staff all very hospitable. No bar / restaurant onsite but one min walk to neighbouring Bay Gardens Hotel for them. We used the courtesy bus daily to go to Bay Gardens Resort which is right on the beach. Would stay here again. Great stay and vacation! Highly recommend! Really enjoyed our stay at Bay Garden Inn. The staff was really friendly and attentive. Hotel and room was very clean. Breakfast buffet was very good each morning. WiFi worked great. The hotel is in a very convenient location to shopping, dining, casino and the beach. I would definitely stay here again. Stayed here for ten nights and have no complaints whatsoever the rooms are spacious clean and well equipped nice and relaxing with nice pool. The staff are amazing and very helpful clean beach towels available every day and rooms cleaned to a high standard every day.